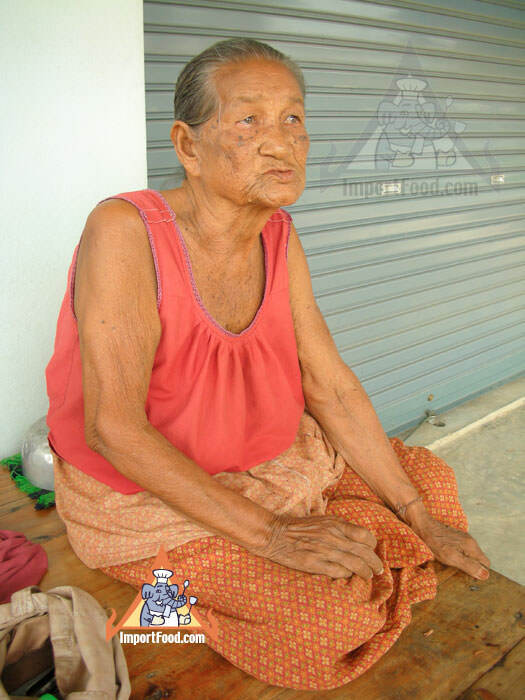 It's hard to find anyone under 70 years old who chews betel nut in Thailand, but for generations (some archeologists suggest it's been used for over 4000 years) betel nut chew was part of everyday life for not only millions of Thais but also Asians throughout the region. Scientists can describe in pharmacological terms the phenols & alkaloids, and other compounds of Mahk, which has very strong spicy flavor and also stimulates the brain & salivary glands. Looking through ancient Thai books, photos and royal archives always show this unique set--the "Chien Mahk" (shown at left, that set is belonged to our elderly aunt's grandmother) as part of every household just as today you find a rice cooker, wok, & mortar and pestle. Yet today, it's suddenly become extinct, as the new generation finds mahk old-fashioned and responsible for stained teeth. The spicy bai plu leaf is used in cooking various recipes (coming soon) but it's days as a chew wrapper seem to be numbered. 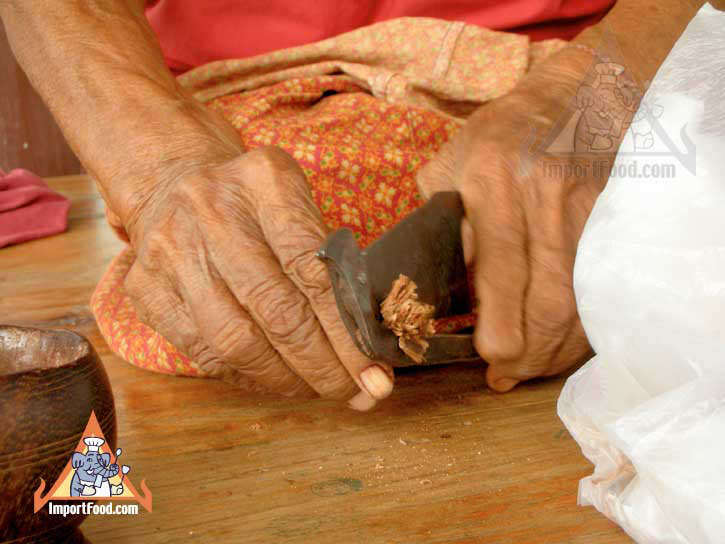 We thought we'd take a few photos for anyone interested in the history of betel nut chew in Thailand. Antique hunters take note too--these ancient sets & tools are an interesting bit of Asian history. Betel chew consists of three main ingredients: bai plu leaf (betel leaf) which is similar but not the same as the milder bai chaplu, used for miang kham, limestone paste (calcium hydroxide, made from baked sea shells) spread thinly on the leaf, and betel nut (areca nut) which grows in bunches similar to grapes. When combined these three things are an addictive stimulant which creates a feeling of strength, awareness, the eyes become wide awake and for some reason the saliva glands open up wider than ever--so the mouth literally pours out saliva (it turns red due to chemical reaction) which gives a cleansing sensation. The aroma is pleasant, a bit like menthol, and middle-aged Thais will tell you when they smell it they think of their grandparents. 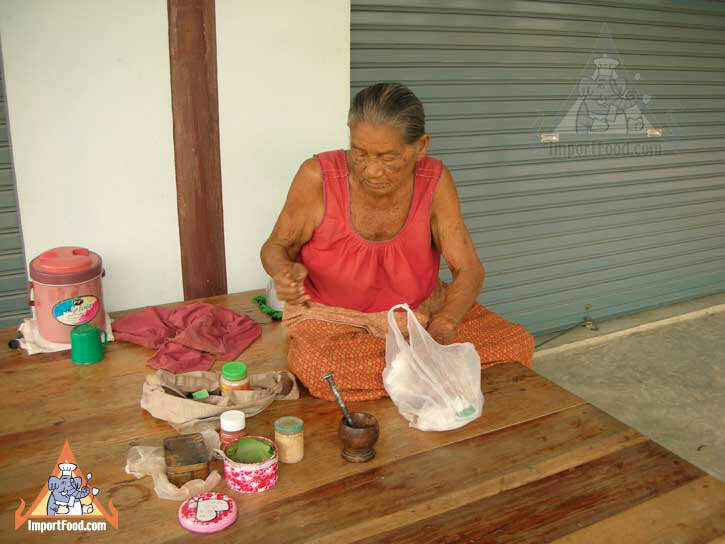 Many adults of today recall spending their days collecting the ingredients for their grandparents' betel chew. Around the time of King Rama V (200 years ago) the Thai government, in an effort to promote a more modern society, embarked on a campaign to stop the use of betel chew. 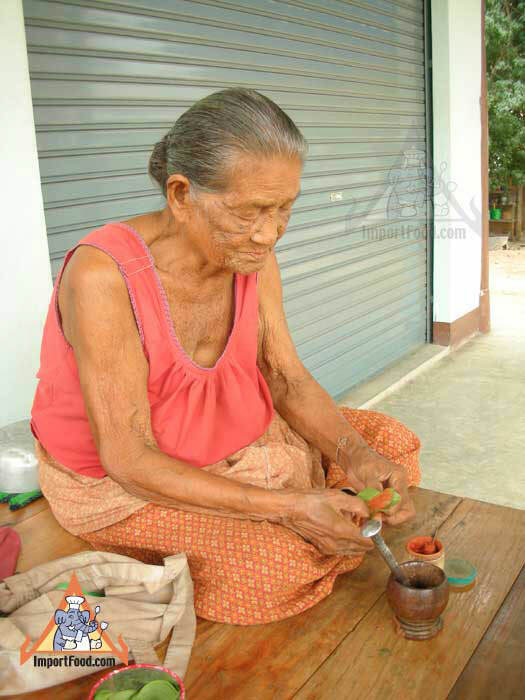 It's taken a long time but now (we wrote this article in 2007) we are about to see the end of this custom in Thailand as the final generation of betel chewers passes on. As a reminder of the importance of betel chew in Thai culture, many important Thai traditions of today such as weddings include the chien mahk--for example when the two founders of ImportFood.com got married, part of the celebration included a parade called "Kabuan Khan Mahk" in which the groom's family presented a chien mahk to the bride's family. When new buildings are opened, usually the spirit house placed at the building has a chien mahk inside as well. Antique betel trays, especially those made of brass, are often found in showcases throughout Thai homes. 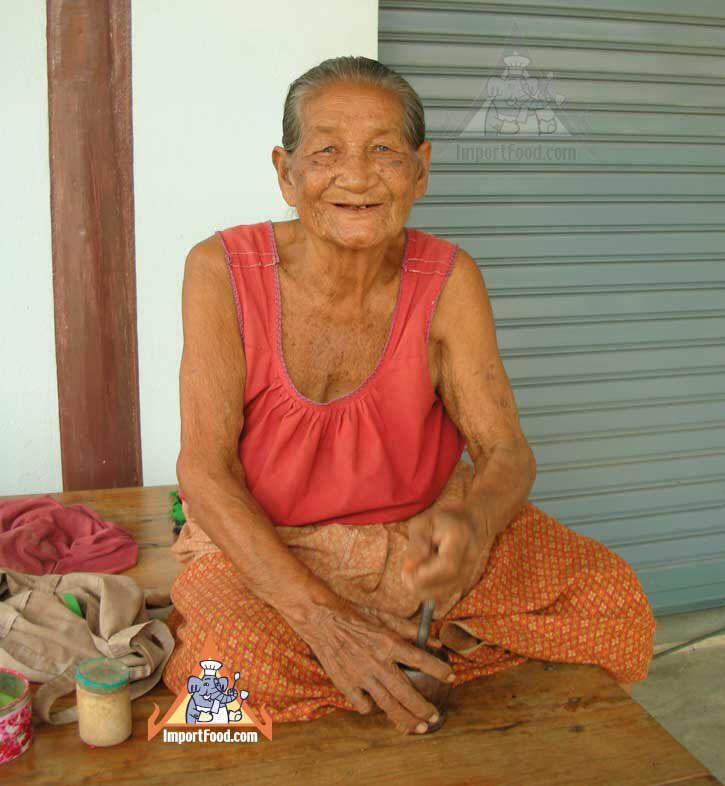 This is one of the most treasured antiques among Thais today. 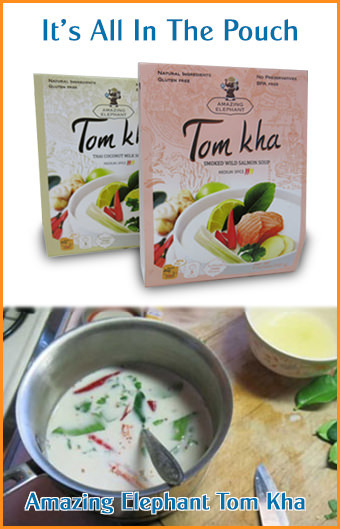 Mahk is usually made with the bark of a "si siet" tree, known in English as acacia (or acacia pennata) which grows wild all over Thailand. The bark is clipped with special scissors made just for that purpose (see photo below) and pounded up well into a fiber. 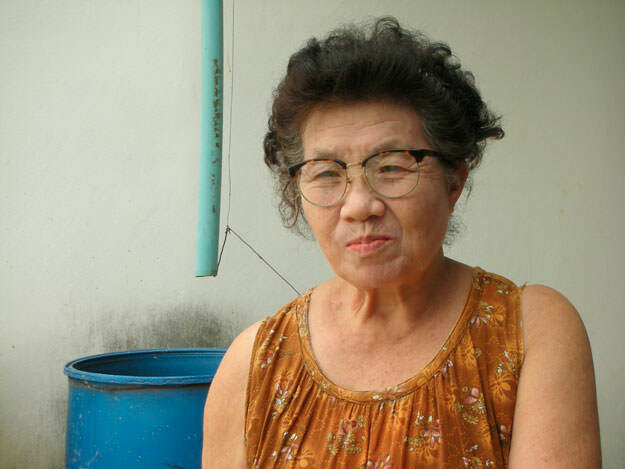 Many people nowadays can tell stories about when they were kids, they'd pound the si siet bark for their grandmother's betel chew. The bark does not add taste, but it acts as a binder to keep everything held together. Some people boil the bark until it's reduced to a thick mud, set it to dry then form it into a golfball-sized lump. This ball is then kept aside, and very small grains of this ball are added to the chew--the chemical compound of this turns saliva red. 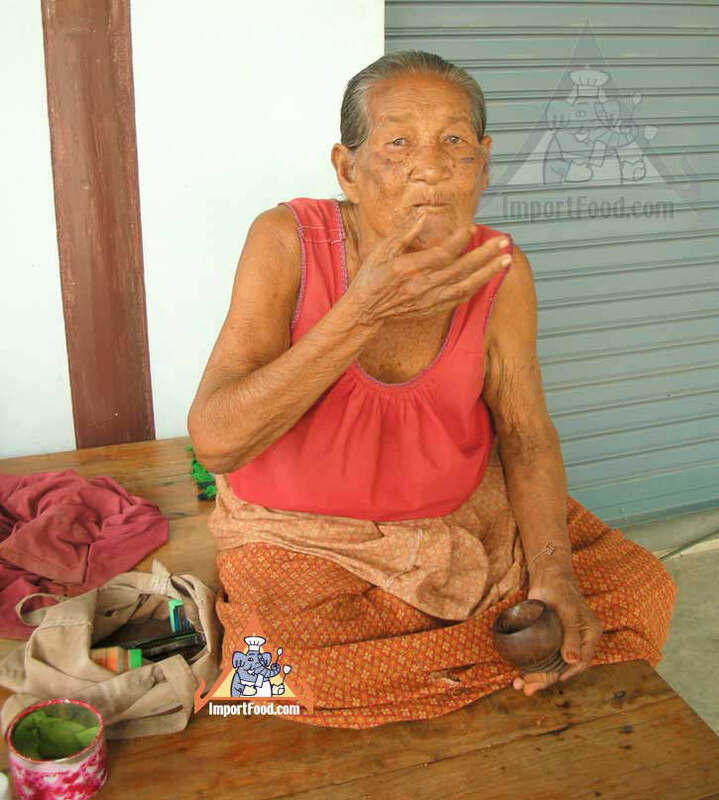 Betel nuts (shown above) are very strong and one person would not be able to chew on 1 whole nut in a day. The nuts are quartered, and set out in the sun to dry. After they're dried, a family will tie the quarter nuts together in a necklace-type rope, and hang it in their house to use as needed. 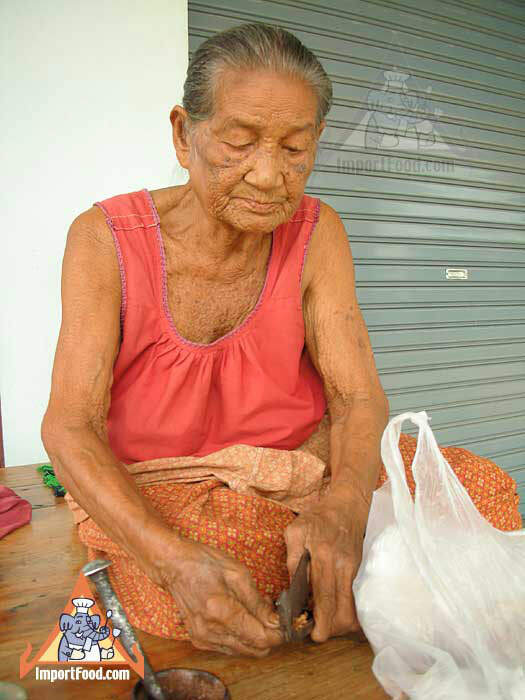 The dried center of the betel nut, called "Tahb Mahk (tahb also means liver) is used, and the dried outer shell "Pluek Mahk" is also used--usually a person uses one or the other, based on personal preference. 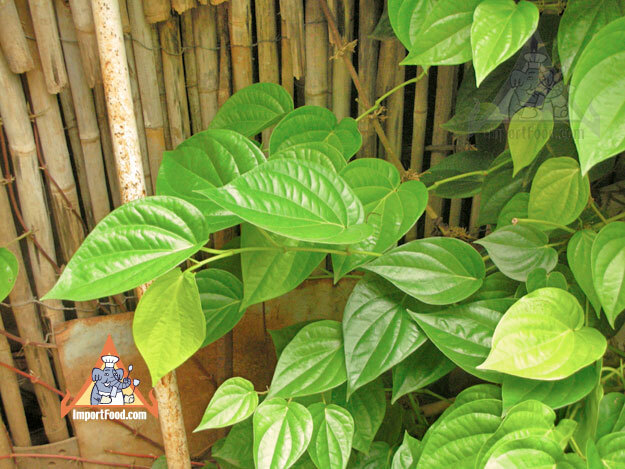 Another common ingredient in betel chew is "Plai", known as zingiber cassumunar and touted as a soothing natural ingredient in cosmetics & lotions. Plai grows underground like ginger and it's bright yellow. 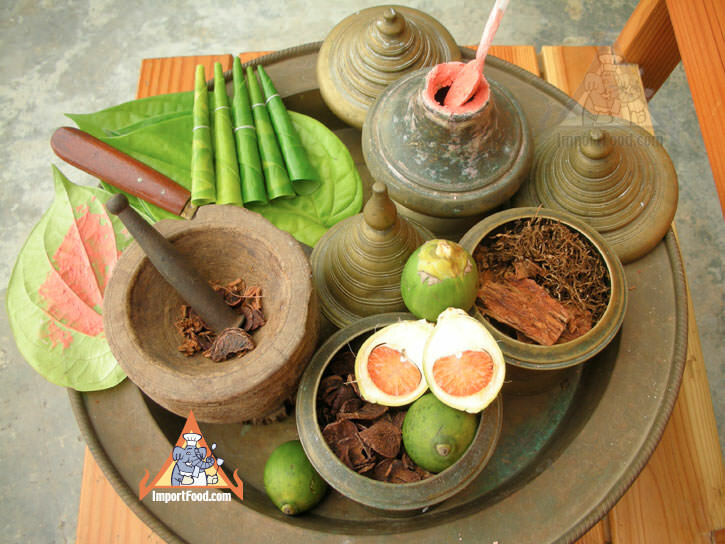 Often tobacco is added to the betel chew. Depending on preferences, other spices are added as well. Everything is wound up together in the betel leaf and popped in your mouth to chew. 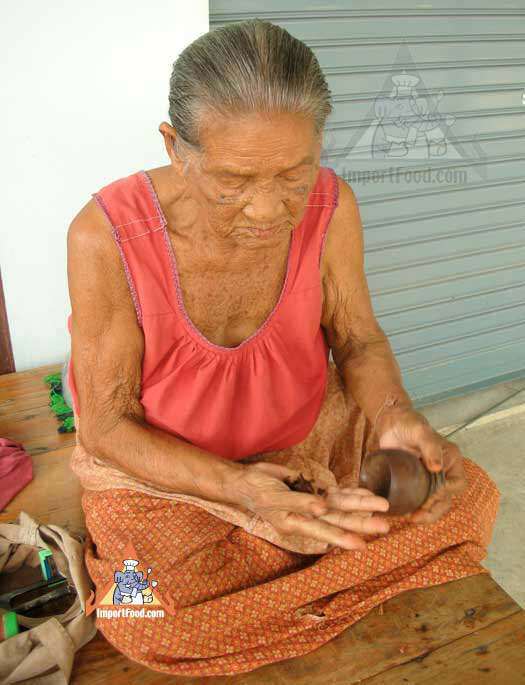 Many older people (such as the elderly lady below) pound it all up first and put it in their mouth without it being wrapped up in a leaf.